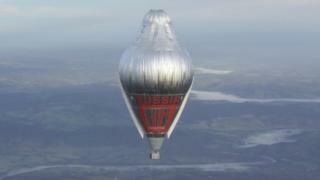 A Russian balloonist has set a new record for flying non-stop around the world, his support crew have said. Fyodor Konyukhov's balloon was said to have passed directly over the airfield in the Australian town of Northam where he began his journey 11 days ago. If his record is confirmed by the World Air Sports Federation, he will have taken more than two days off the record set by American Steve Fossett in 2002. Konyukhov, 65, landed safely about three hours after passing Northam. "He's safe, he's sound, he's happy. It's just amazing,'' support crew member John Wallington said from the landing site in West Australia. "The record is broken, no question. He flew over the same field which he took off from." Konyukhov's route took him from Australia to above New Zealand, the Pacific Ocean, South America, the Cape of Good Hope and the Southern Ocean. As he made his way back to Australia, his website reported his comments as a polar jet stream pushed him towards Antarctica. It is "scary to be so down south and away from civilisation," he said. "This place feels very lonely and remote. No land, no planes, no ships." His crew said the balloon, which is 56m (183ft) tall and uses helium and hot air, covered the route in 11 days and six hours, beating Fossett's record by more than two days. The American, who also started from Northam, took 13 days and eight hours in setting his record. There has been no immediate comment by the World Air Sports Federation.